The Problem: For years The Hartford had been buying off the shelf plush toys and giving them away to clients and other organizations to promote their brand. There was a problem though....the plush did not look anything like their mascot nor did it carry The Hartford logo or brand name. 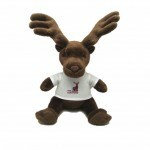 The Solution: New England Toy had a solution and developed a custom plush toy that would look like their mascot right down to the logo t-shirt that the full size "Larry" the Stag mascot character wears at public appearances. The Result: A promotional plush toy that The Hartford can be proud to give out and one that promotes their brand in a unique, friendly and fun way!